The genus name, Eupatorium, is derived from the ancient king Mithridates Eupator, who was the first to use a similar plant for medicinal purposes. Perfoliatum is a reference to the manner in which the stem appears to perforate the base of adjoining leaves. Other Common Names: Wood boneset, thoroughwort, sweating plant, thorough-stem, teasel, agueweed, thorough-wax, feverwort, wild Isaac, crosswort, vegetable antimony, Indian sage, tearal, wild sage. Habitat: Boneset is mainly found in the temperate regions of North America, ranging from Florida to Canada. It is found as far west as Texas and is a common weed along the edges of swamps and along streams. It has a high affinity for moisture and prefers wet ground. Description: A characteristic feature of boneset is the unusual arrangement of the leaves. Opposing pairs are joined at the base so it appears as though they are one leaf which is pierced in the center by the hairy stem. The plant can reach a height of roughly 5 feet and produces flat-topped clusters of white flowers. It is a perennial which typically flowers between the months of July to September. Plant Parts Used: Mainly the leaves and flowers are used, the latter commonly being dried after harvest. The boneset plant has various medical properties such as analgesic, antibacterial, anti-inflammatory, diaphoretic, febrifuge, immune stimulant, laxative, and stimulant. Boneset is a traditional natural remedy used by the American Indians in the treatment of a wide range of conditions. These include colds, influenza, rheumatism, dengue (also known as break bone fever, hence the name boneset), malaria and typhoid fever. There has been some scientific research which has shown that boneset can be used to treat the common cold, and as a natural treatment for the flu, due to possible stimulation of the immune system. 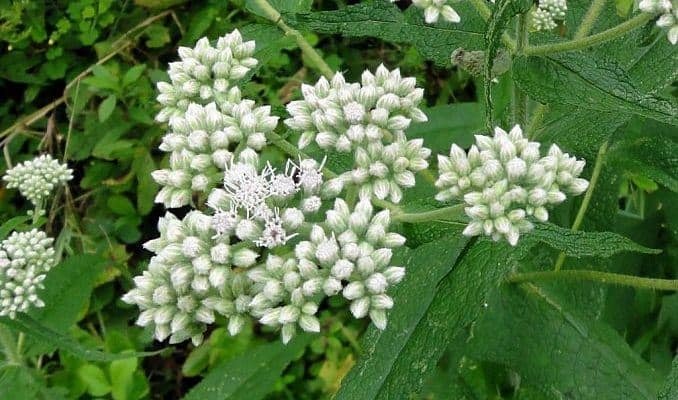 It is also thought that boneset can increase the resistance to infections, loosen phlegm (especially in older patients). Boneset is both a diuretic and a laxative and it is used as an herbal remedy for relief of constipation as well as a herb that aids urine flow. Flavonoids found in boneset have shown promise as a natural herbal remedy to help fight against tumors. 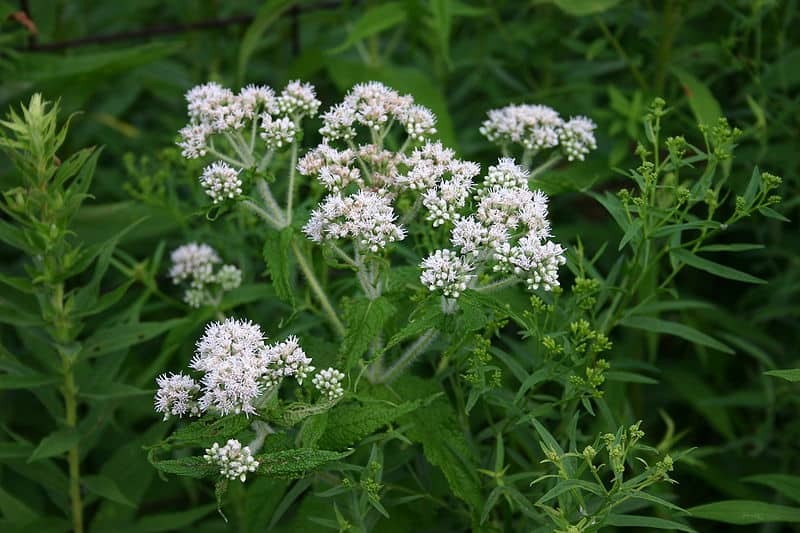 Other traditional uses of boneset include migraine relief, treating various ailments related to bowels, liver, stomach, and uterus as well as treatment of jaundice. Additionally, it has been used as an herbal folk medicine for fibromyalgia, diarrhea and intestinal worms. Some studies done on animals indicate that boneset does, in fact, have the ability to reduce the symptoms of arthritis and malaria. While few clinical trials have been done, there is anecdotal evidence of this in humans. Boneset is thought to reduce fevers by increased sweating. 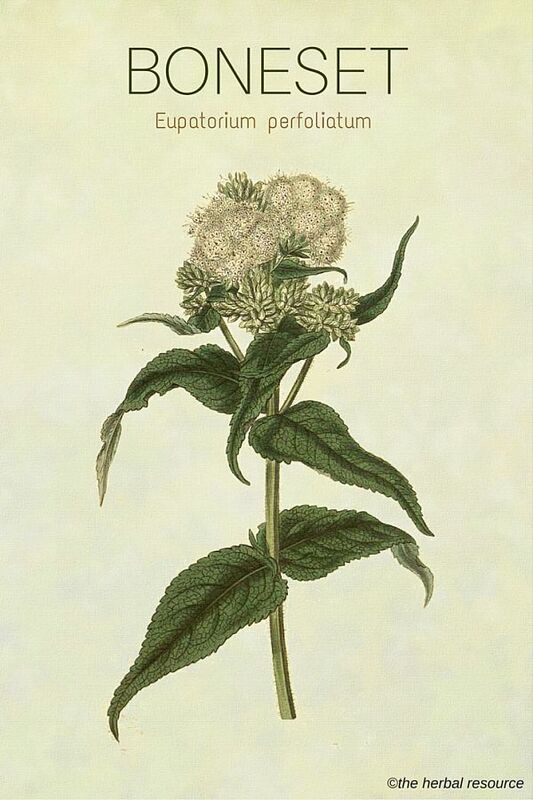 Boneset has anti-inflammatory properties that make it a useful herbal remedy for topical skin irritants. It is also being studied for its ability to aid and subdue skin diseases. The mode of administration of boneset depends on the condition for which is being taken. The traditional means are as a tincture or a tea. It is thought that a hot tea is best for the treatment of colds and fevers, even though it does have a bitter taste. Teas are made by adding boiling water to approximately 1 to 2 grams of the herb (about 1/2 teaspoon). This is allowed to steep for a maximum of 15 minutes and then drunk. Three cups a day should not be exceeded. The tincture is best used as a tonic or laxative. It should be taken thirty minutes before meals and 4 ml. (3/4 teaspoon) three times a day is the recommended dosage. The plant does contain minimal amounts of potentially liver-harming pyrrolizidine alkaloids so overdosing should be avoided. Boneset is fairly free of major side effects. The herb does not have the best taste in the world and, as such, some cases of nausea or vomiting have been reported. It is thought that the dried herb causes less of a reaction than the fresh plant so this is an option for those experiencing such symptoms. While the plant only contains trace amounts of pyrrolizidine alkaloids, those who are suffering from liver diseases should not use it. Others who should avoid the use of boneset include women who are pregnant and breastfeeding. No one should use boneset for longer than six months at a time. Speaking to a health care provider is recommended before considering trying this herb as a natural remedy for any condition. I was taught to use blood temperature water to make febrifuge tea as it is less nauseous. We dry it and make capsules, taken as prophylactic along with elderflower during flu season….haven’t had the flu in many years.